Just a quick post to let you know that I’m jetting off to a hopefully sunny Madrid tomorrow so I won’t be posting for the next few days. But fear not, keep working on your Spanish and I’m sure that I’ll have gained a wealth of information during my trip, so keep your eyes open on Friday when I can share it with you all! Bienvenido, now who am I? I’m Sam Neal and I’m a 16 year-old Spanish learner. Now I know what you’re thinking: I’m only 16, so what do I know? Well, I’m not here to provide Spanish lessons as such, more to share my Spanish learning experiences and to post new Spanish as and when I learn it, so that you can pick it up too. I’ve been learning Spanish for just over a year now, and would consider myself an intermediate Spanish speaker. That is, I can communicate pretty well with Spanish people, and have a good range of vocabulary and a good understanding of grammar. However, there is still a long way for my to go to achieve my goal of Spanish fluency, so keep an eye on this blog and hopefully there’s a lot you can pick up and learn. If you like something, or have anything similar to add, don’t forget to leave a comment so that we can all benefit from your thoughts. Enter your email address to be kept up to date via email. So you're learning Spanish? 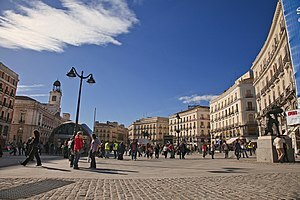 Well, I created Stories from a Spanish Learner to keep you up to date with my learning and to provide you with new vocabulary and grammar points as and when I pick them up.